I am very pleased to return from the 3rd Biografilm festival of Bologna, Italy, with the Lancia Award, awarded at the closing ceremony on June 10th. 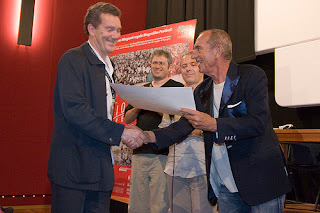 The Lancia Award is given to the director of the film which in, in the view of the festival, marks the most outstanding achievement in this festival dedicated to celebrating human lives. Although Biografilm is a newish event on the festival calendar, it has given the Italian or European premieres to films such as Werner Herzog's Grizzly Man, Tarnation, KZ and works by Atom Egoyan, Paul Weitz, among others. There were 350 features entered, some of which had won awards at Tribeca, Amsterdam and other festivals. There is something very emotional about receiving an award for such a personal topic, especially given the paradox that I could not really finish the film in the way I wanted while my father was alive, and therefore he could not be around to see this happen. I did feel that he was watching the award ceremony though, from somewhere. Thanks so much to all those who helped so much in making the film and in supporting it!